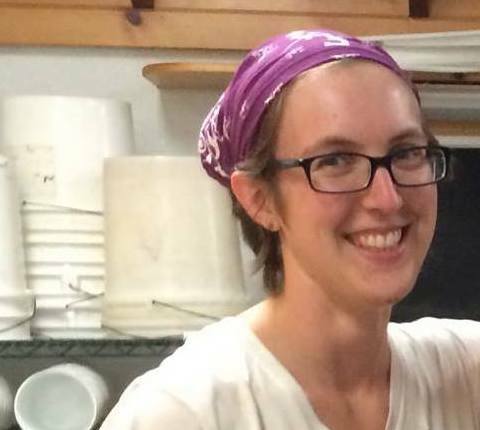 Meet our new head chef, Laura Keeler! We’re excited to announce that this year, we have hired Laura Keeler to head up the kitchen for both Weekend A and Weekend B! Laura has cooked for college students, wedding guests, Buddhist monks, and more folk dancers than she can possibly count. She found her footing in the kitchen at Pinewoods Camp and then discovered that baking pies could be a full-time job and a great way to stay warm in New England winters. Now working in scholarly publishing, she still thinks kitchens are the best places to make friends. While Laura has a wealth of experience cooking for groups of all kinds, she’s new to Epic Skill Swap. So please get ready to give her a warm welcome and also enjoy fabulous meals at Skill Swap this year. This entry was posted in Uncategorized on May 8, 2017 by Dana Dwinell-Yardley.